The historic flight launched 50 years ago this week. Anyone old enough to remember Apollo 11 has vivid recollections of Neil Armstrong taking those first steps on the moon, and even those born years after the celebrated 1969 mission know its place in history. But Apollo 11 wasn’t the first moon shot. That distinction belongs to Apollo 8, which launched into space 50 years ago this month. True, none of the Apollo 8 astronauts — Frank Borman, Jim Lovell and Bill Anders — walked on the moon. But their moon-circling flight yielded a trio of firsts: the first humans to venture beyond Earth’s gravitational grip; the first humans to see the moon’s far side; and the first time we saw our home planet as it really is — a tiny ball floating perilously in the vastness of space. The mission came together with startling speed. The nation was still reeling from the tragic launch pad fire that killed the three astronauts aboard Apollo 1 in January 1967. But President Kennedy’s 1961 pledge to land astronauts on the moon before the end of the decade had yet to be realized — and the Soviets were rumored to be preparing a manned lunar mission of their own. So while it was originally conceived as another in a long string of Earth-orbiting missions, Apollo 8 became a moon mission. The massive, 36-story-tall Saturn V rocket needed for such a mission had been tested only twice and had never carried a crew. Borman, Lovell and Anders would be the first. They figured they had a 50-50 chance of coming home. The astronauts fired the engine that would put them on a lunar trajectory, and from that point on, they were setting altitude records. Until then, the farthest that a human had been from Earth was 850 miles, during NASA’s Gemini 11 mission two years earlier. Speed records also fell by the wayside, as the craft sped along at more than 24,000 miles per hour. As Earth receded in the distance, Lovell described his view out the window: “I can see Florida, Cuba, Central America, the whole northern half of South America — in fact, all the way down to Argentina and down through Chile.” No human had ever been able to see so much terrain in a single glance. Lovell would later note that, as they circled the moon, a quarter of a million miles from Earth, he could hide our entire planet behind his outstretched thumb. Anders was tasked with photographing the lunar surface in anticipation of an eventual landing. Taking snapshots of our home planet wasn’t on his to-do list. But when Earth came into view after their third orbit of the moon, the crew looked out of the capsule’s tiny windows to behold an awesome sight. The photo became a national sensation. Within a year, Earthrise was on a U.S. postage stamp. In 1970 it became the symbol of the first Earth Day. “More than any single image, it helped underpin the environmental movement,” Logsdon said. The mission was also TV gold. Millions tuned in for the crew’s broadcast on Christmas Eve 1968. Asked only to deliver an “appropriate” message, the crew took turns reading from the Book of Genesis. They saw the reading as an acknowledgment of cosmic grandeur, though not everyone saw it that way. In 1971, an outspoken atheist named Madalyn Murray O’Hair sued the federal government for contravening the separation of church and state. The case was dismissed. But the engine fired successfully on the morning of Dec. 25, prompting Lovell to quip to Mission Control: “Please be informed there is a Santa Claus.” Two days later, the astronauts splashed down safely in the Pacific Ocean, their capsule's once-white exterior blackened by the intense heat of re-entry into the atmosphere. Seven months later, Armstrong and Buzz Aldrin left their bootprints on the moon. The moon missions came to an end with Apollo 17 in 1972. But late last year, NASA pledged to return astronauts to the moon with the goal of establishing a long-term presence there. The agency, which is collaborating with other nations and with private companies, hopes to see a lunar-orbiting mission by 2023 and a landing by 2030. Of course, no matter how routine moon missions eventually become, there can only be one first time. 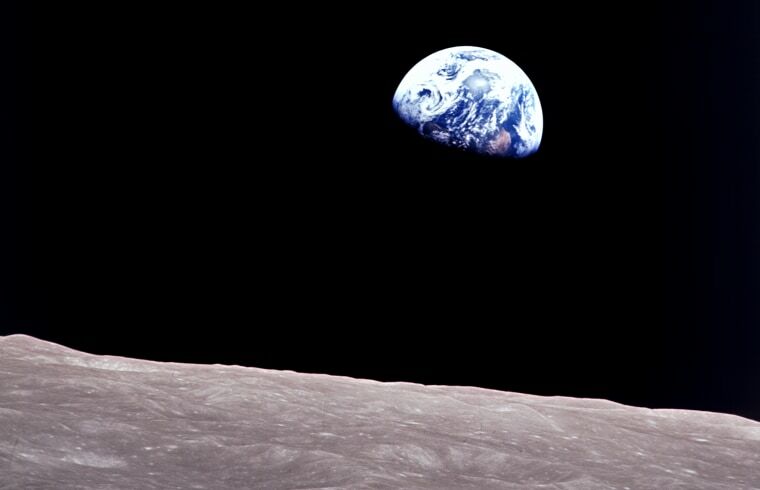 With Apollo 8, humanity took its first tentative steps beyond our home planet. Dan Falk is a science journalist based in Toronto. His books include "The Science of Shakespeare" and "In Search of Time."